When it comes to choosing a wine rack for home use, whether it’s for a prime position in the kitchen or just for storing in the garage, we’ve probably all been guilty of finding something in a shop or online and saying ‘that’ll do’. What happens then is that you probably end up with a ready-made wine rack holding 24 or 36 bottles of wine with a further dozen or so stacked like a pyramid on top with a couple of odd boxes on the floor beside it. Looking to store wine in your own home, bar or restaurant? Our handy wine storage guides can help! If you decide where you want to position your rack and what space you want it to fill then you really don’t need to buy something totally ready-made and unsuitable ‘off the shelf ‘. The alternative is to have something made to measure and this really isn’t as expensive as it may sound. The only thing you need to consider is that the galvanised steel framework racks with pine slats which we call traditional wine racks can take up to a couple of weeks to be built and delivered. They are made for you, your measurements, for your space; therefore they take a little longer than a ready-made product. The beauty is that you can decide on the height, the width and the wood colour from one of the seven different stains we offer. 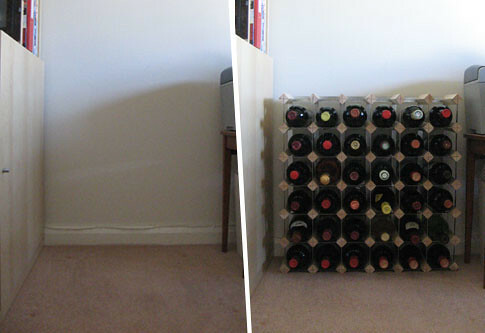 Measuring up for a traditional wine rack is easy. Once you’ve downloaded our ‘Wine Rack Dimension Chart’, you’ll see lots of different numbers and sizes, you may find it a little confusing at first, but trust me, it really isn’t! What we’d recommend doing first of all is measure your available space; the height and width of where you want to put your wine rack (make sure the floor is stable and even). Once you’ve done that, you can work out exactly what you need! Let’s say you have a vacant space you wish to fill which measures at 7 feet wide by 6 feet high. This available space equates to 84″ by 72″ (or 2,131mm by 1,828mm). Our dimension chart then allows you to work out the amount of either standard bottles, magnums or half bottles which will fit into a rack within the space you have available. Invariably the most popular wine racks we supply are for everyday standard 75cl bottles (The size for these bottles is on the left hand side of the chart). With your available width of 84″, you’ll then need to find where 84 is on the dimension chart – this lies between 87 1/2″ and 83 3/4″. Easy so far right? Good! Then, the next part is common sense, if you have an available space of 84”, then it’s pretty obvious that if the wine rack was made to 87 1/2″, it won’t fit. The secret is to find out where your available measurement is on the chart and then the rack would needs to be made to the measurement immediately below, in this case, the width of the rack would be 83 3/4″. This gives you a wine rack 22 bottle holes wide. If the same is done with the available height of 72″, then you end up with a rack which is 68 3/4″ high (18 bottle holes high). The net result is that you will end up with your very own Traditional Wine Rack, 22 bottles wide by 18 bottles high, 396 bottles capacity with hardly any wasted space. The traditional wine racks really maximise your available space, supplying you with a neat and tidy, easy to organise wine collection! 3) Double check your sizes! Width, Height and total bottle size. 4) Get in contact with Wineware! 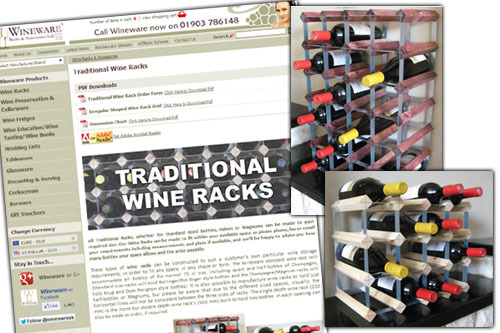 You can either call 01903 786148, email info@wineware.co.uk or post us with your measurements (using the wine rack order form). We will go through it all with you, making sure your measurements and calculations match up with us! We will also make sure that the size you’ve chosen will actually be able to get to the area where you want to position it, if it’s made in one piece. If this isn’t possible we can make the rack in two or more pieces in order to make it fit through doorways etc and this can then be connected back together once in place, to make one large rack and you’ll never spot the join! 7) Wait for your rack to arrive – simple!